The final countdown of the year always make me think about what happened over the course of the past 365 days. 2006 wasn’t as difficult. We spent the summer touring Canada with the show (better then than in winter! ), and unfortunately had to put down our dear cat Mary while at our first stop, in Vancouver. She had been ailing for several months. 2007 has been a very eventful year, with many changes. A year ago today, James and I left Bisbee by car to go back on the road with Phantom. Our destination was Toledo, Ohio. Our first overnight stop was Albuquerque. It had just snowed a record 22 inches, and I-40 was closed. We were stuck at a Motel 6 for three days! We barely made it to my first rehearsal for the show (2000 miles away), two days later. In January, my 90-year-old father contracted pneumonia and went into the hospital. He was in and out of various facilities for the next six weeks, and died on February 17th. My final show with Phantom was the next day! James and I came home to Bisbee and experienced a “crash course” in small-town politics and small-town mindsets. We must have been wearing blinders for the past five years! Our house was filmed for national television (HGTV) on April 9th, because of James’ wonderful artwork inside and out. What an experience that was! On May 15th (the day after James’ birthday) we decided to move to Northern California. The first of several trips took place a few days later. On June 9th, my brother Buzz hosted a wonderful Memorial for my parents at the family house in Sacramento. Many friends and relatives attended, and we shared many special moments which I’ll treasure always. We went back to Bisbee a few days later and started packing. Then we realized that we needed to prepare the California place better to accomodate all our stuff! So we went back to CA on July 6th to clean out the barn. We didn’t return to Bisbee until past the middle of August. We packed up the rest of our stuff and rented a small truck to haul it to our new home. It’s hard to believe that we haven’t been in Bisbee since the end of summer! I have been pleased to get some horn work in Sacramento and San Jose since October. My most recent stint was playing the Nutcracker in San Jose. It had been eleven years since I had performed this wonderful holiday music, and it really put me in the mood! So it has been an excellent year, taken all around. James and I are very happy in our “little piece of heaven” (as our Florida friend Arlene just termed it). May 2008 bring each and every one of you happiness and prosperity! I just received word this morning that a former musician colleague of mine was killed in a motorcycle accident on Tuesday night. He was riding his motorcycle down a two-lane highway and hit someone in a pickup truck turning into the roadway. Mark was immediately killed while the lone occupant of the truck was uninjured. How tragic. Mark leaves a wife and three teenaged children behind. I feel a combination of sadness and guilt. The first is totally understandable. The second is a bit more difficult to process. You see, Mark was not well-liked in one of the orchestras I played in. He was Personnel Manager for a number of years and did some things which were definitely not supportive of the musicians, whom he was supposed to represent. He was also a bridge between musicians and orchestra Management. This is a very difficult position for someone who was also a member of the orchestra. One foot in each camp, so to speak. Which way was the wind going to blow? I think that it’s best to hire a Personnel Manager who’s NOT a musician in the orchestra, but this is uncommon. Some orchestra personnel managers lean more towards the musicians, while others favor Management. The former sometimes lose or quit their jobs, so it is no wonder that the latter wants to “play it safe”. In late 1990, Mark went out of his way to disenfranchise one of the musicians in the orchestra. The musician in question took one sick day a year, during the run of Nutcracker ballets in December. He took off one morning performance and was back in time to play the evening show. It was sort of a long-standing “tradition”, understood by musicians and even the conductor that this person would take off in order to go skiing. A sub was always notified in advance. This was no big deal, although it wasn’t strictly “kosher”. This particular musician did not abuse sick-leave at any other time during the nine-month orchestra season, unlike many of his colleagues (including Mark). But Mark and another musician who had a bone to pick with this person, decided to take matters into their own hands. They followed the “sick” musician up to the ski resort in the Sierras with a video-camera, and documented his activities away from the orchestra. This resulted in a suspension of the musician for an entire month. No pay. You can see why I have mixed emotions about this. One can say that Mark was just doing his job. But most members of the orchestra were horrified at this Gestapo-like behavior, going to such lengths to discredit this musician. The organization had just hired a new Executive Director, who needed to flex his muscles and show the musicians “who was boss”. Mark chose to align himself with the Executive Director rather than with the musicians, who were fighting pay cuts and new restrictive work rules proposed by Management. Together, they undermined the musicians’ position. This video-taping event ripped the orchestra apart. It was the beginning of a very long, agonizing, lingering demise of the organization. It wasn’t the cause of its eventual death in 1996, but it was the first nail in the coffin. There were many hard feelings. The other musician who had participated in the videotaping made a public apology, but was never quite forgiven over the next six years of the orchestra’s existence. Mark held fast to his belief that the “sick” musician was in the wrong. Technically Mark was correct. But the lengths he went to to discredit this musician seemed overly harsh to everyone in the orchestra, especially at such a vulnerable time for the musicians at the bargaining table. It had devastating effects on the orchestra, and ultimately on the entire community when the organization declared bankruptcy six years later. A few months following this incident, Mark stepped down as Personnel Manager. Shortly thereafter, he resigned from the orchestra. Sigh. I do feel sad that Mark was killed. It is very tragic, and my heart goes out to his wife, children, family and friends who have lost him so suddenly. I had not intended to go on so long about this, or even write about it at all. But I do feel that I’ve released something in the process. 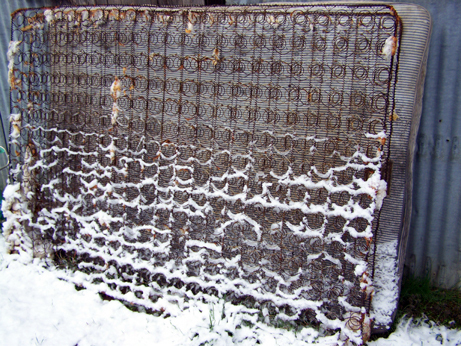 Late last night, the patter of rain on our tin roof changed to the sizzle and plop of snow, as we had hoped. 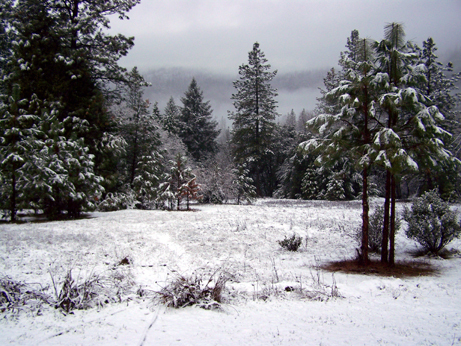 James threw one last log on the fire in the Franklin stove as we went to bed, burrowing under the layers of quilts and blankets, greeting the immediate warmth of flannel sheets. 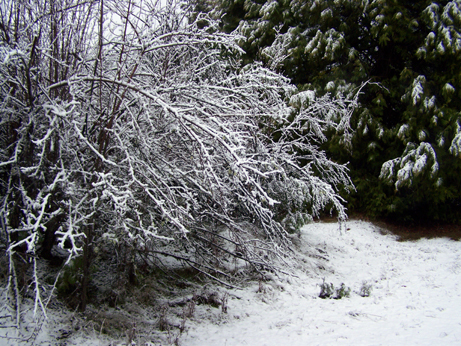 A few hours later, the snow had accumulated an inch. It was a light storm at this relatively low elevation of 2600 feet, with higher accumulations further up the Sierras, just a few miles away. There was another inch by the time we got out of bed at 8:30 this morning. 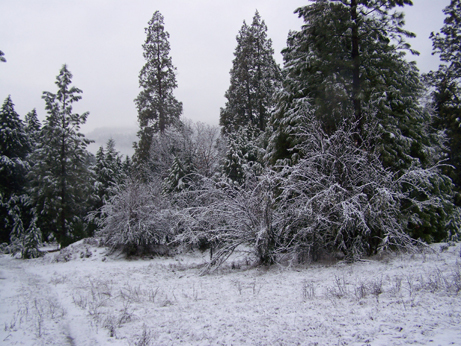 I stayed snuggled in the warm bed while James went out with the camera to capture the beauty of the snow on the trees near our barn compound. Then I brought out the video camera to capture our cat Rupert’s first experience with snow here. He might have seen it in his previous incarnation in Vancouver, but we will never know for sure. We’d like to think that this was Rupert’s first time. For the sake of dramatic license. I spent several hours on the video today. After editing, I added original music and subtitles. It’s the first time I’ve ever tried setting music to video; something I’ve always wanted to do. In a parallel universe, I would have liked to become a movie soundtrack composer. After several fits and starts, I managed to post Rupert’s video on his blog (on Blogger). Please check it out, and Rupert welcomes your comments! Okay, so I’m a complete idiot when it comes to any kind of html or understanding any of my blog’s inner-workings. Today’s demon: RSS feeds and “feed URLS”. I know that there’s tremendous potential to make my blog completely wonderful, bristling and clanging with all sorts of bells & whistles on my sidebar, drawing the blog reader in like flies to flypaper. But it would be a miracle if I achieve ANY of it here. No matter how hard I try to wade through the WordPress help sections, reading about RSS feeds and feed urls and permalinks on the FAQS and forums, I just don’t get it. I love computers but don’t understand their inner workings as well as my younger counterparts seem to, or those of you Baby Boomers who seem to have grasped the concepts. Today’s fiasco started with an introductory email offer from BLOGRUSH, which is a blog syndication service and looks like a good way to get my blog out there for more people to read. Registration went swimmingly until I had to enter a “feed URL” for my blog. Thus began an extremely frustrating three hours of research, and repeated attempts at trying to find the correct feed URL. I still haven’t figured it out, although now I do know that the “code” that BLOGRUSH provided after my registration needs to be pasted into a text widget on my WP widgets page. I was able to find my feed url from this page but after submitting it to BLOGRUSH it’s still not showing up in my side-bar. Grrrr! I finally emailed someone on the forums who had thoughtfully replied to some other hapless blogger trying to figure out feed URLS. I hope he writes back. I feel so incompetent about this. Not pleasant at all. Plus, I’ve just come down with a whopper of a cold. James got it a few days ago and is still suffering. ‘Tis the season, I guess. Many people around here have colds now, and I’ve just heard that my dear friend in England has one. I started getting sick during the Nutcracker show in San Jose yesterday afternoon. Luckily I got through the show with a minimum of hacking and coughing, although the storm front moved in BIG time towards the end of the ballet. James and I were going to stop at a friend’s in Lafayette (an hour’s drive north of San Jose) to have dinner with her and her elderly father, but we decided to cancel. For one thing we were not feeling at all well, and of course we didn’t want to give our friends a cold either. I’m taking zinc lozenges which were recommended to knock out a cold in half the usual time. I sure hope it works! 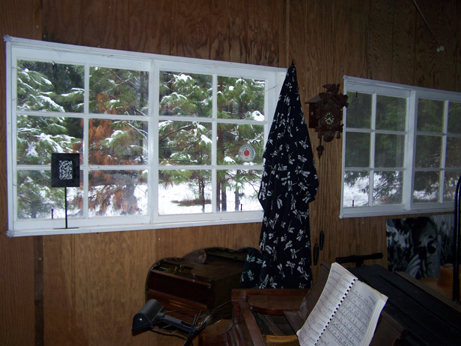 So we are at home, bundled up in the Music Room. James is making homemade chicken soup and tending the fire in the Franklin stove as usual, while I am getting close to throwing my computer against the wall. I decided to take a break and write a post instead. I may be writing a LOT of posts over the next few daze. You may die of shock. It’s supposed to snow up here tomorrow. I’ll keep you informed! So I have revived my blog on Blogger so that I can use BlogRush there. I now have two identical blogs; one here and one on Blogspot.com. Twice the work and half the fun — LOL. We have a clothes washer, but not a dryer. 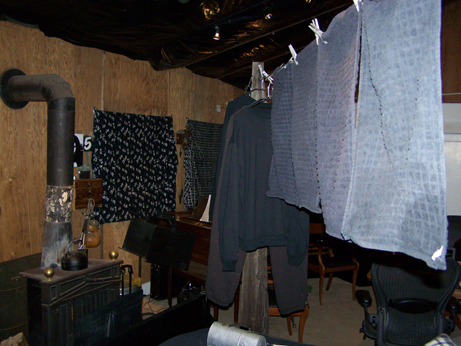 One reason for not owning a dryer is that we prefer clothes that are dried out on the traditional clothesline. The natural way. Sun-dried clothes smell so fresh and good! Another reason is that our electricity is not wired for 220. Yes, things are primitive out here In The Woods. Besides, in recent years both James and I seem to have become almost violently allergic to dryer sheets. They stink to high heaven! We can smell them literally a mile away, from our neighbor B.’s house, when the wind is right. It was weird this summer to walk through our pristine meadow and suddenly catch a whiff of….DRYER SHEETS? Out here??? My sister-in-law uses them, as do most people. I did, too, Back In The Day Before I Became An Old Curmudgeon — when I wasn’t so sensitive to chemicals. Whenever James and I stay at the family compound in Sacramento, in the “Yonder House” (the bungalow which had been built for my parents in their last years) we chafe and itch on the bedsheets. We’ve talked about suggesting (diplomatically, of course!) that my sister-in-law pour a half-cup of vinegar into the fabric softener compartment of the washer, which effectively softens the clothes without the chemical intrusions of dryer sheets. If this falls upon deaf ears, we plan to bring our OWN sheets to use on that bed from now on. Then we can launder and dry them ourselves. 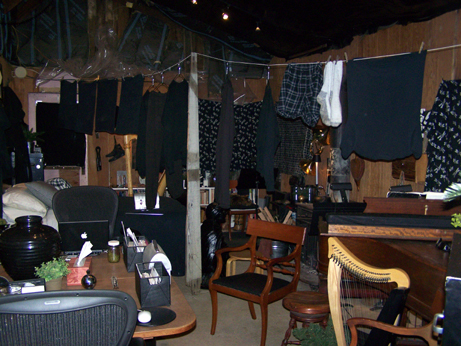 I stayed at Yonder House this past weekend, and washed some clothes. Unfortunately the wash cycle didn’t finish before I had to rush off to play a concert on Sunday afternoon, so I asked my brother to throw them in the dryer while I was gone, which he was happy to do. But I forgot to ask him NOT to use dryer sheets. My bad! So my black sweatshirt and sweatpants (our usual garb In The Woods) were infused with their cloyingly sweet chemical perfume. I thought I’d try an experiment in which I didn’t tell James about it when I changed into them once I got home, and see if he noticed anything. So much for trying to pull the wool over James’ eyes. He doesn’t miss a thing. The truth is, I couldn’t stand the smell either, and was about to take the offending sweats back off. Back to drying clothes on the line: for all practical purposes, it is now Winter here In The Woods. The sun’s declination is quite low; it barely skirts above the hills surrounding our property. The sun’s rays don’t peek out from behind the barn where the clothesline is until almost 11 a.m., then it dips behind the southern slope by 1:30 p.m. This little window of time, combined with freezing temperatures, makes it impossible to dry clothes out on the line in Winter. 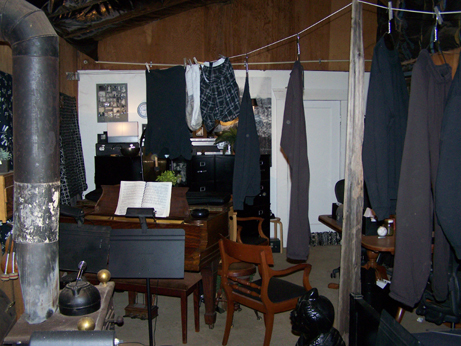 So James thought of rigging up a clothesline in the Music Room, near the Franklin stove, which dries the clothes out very nicely in two hours. I took the following pictures a couple of days ago. 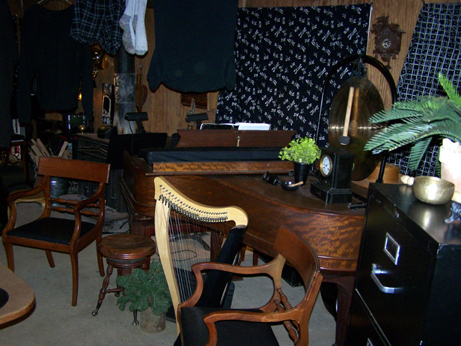 Along with the clothesline, you’ll see my mother’s legacy to me, her 1906 Steinway grand piano. Its arrival last Saturday shall be the subject of my next post. It’s quite a story! We use these black dish-towels (a bit faded) instead of paper towels. None of our clothes are white, actually, except for my musician uniform dress shirts (not pictured here). The chairs were part of my parents’ original diningroom set bought in 1941. James recently re-covered them in black naugahide Volkswagen car upholstery. Shot from the other side of the room. The diningroom table is also part of the 1941 set. I sit at the end nearest the camera (with my laptop) while James sits on the opposite end with his laptop. Notice the board holding up the clothesline in the middle! We will eventually finish off the insulation at the top of the far wall — ha ha! I’ve already told you we live in a SHAQUE! As you can see, our clothes match our decor. This is NO accident, thanks to James the Artist. Also, all the plants are fake. Aren’t they convincing? And we can’t kill ’em. Two of my most prized family possessions are the grand piano and the black marble French clock. The first from my mother and the second from my father. I’m glad that James combined the two so closely, which has never happened before. The window coverings are actually sarongs. We wear them during the warmer months. We love multi-functional stuff! A mix of the Old & the New: my electronic keyboard sits atop the grand piano. 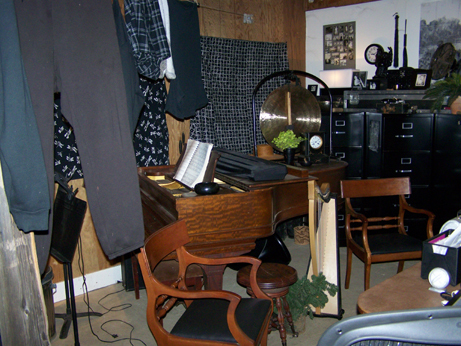 The piano stool between the chairs was found by my father at an antique store in Northern Virginia circa 1969. He removed five coats of paint to get down to the natural wood finish! I bought the gong at a New Age store in Nashville while on tour with Phantom. It has a lovely sound. I just got back from a three-day stint of performing Christmas music in Sacramento, with the Choral Society Orchestra. It’s the first time in eleven years that I’ve played this kind of music. It’s put me in the appropriate holiday spirit. It was FUN, although challenging and demanding work. No small task, pulling together a long program in only two rehearsals. Even if I hadn’t gone on the road with “Phantom” for a decade, I would have enjoyed playing this Christmas music. But I do appreciate it more now, after having played the same show over and over again. This is the third gig that I’ve played with my former colleagues in Sacramento since October. It is wonderful to be back here, playing horn in these little orchestras, but I continue to experience a strange feeling of displacement — as though I am Rip Van Winkle waking up from a ten-year nap. It’s as though my long time on the road was just a dream. Almost everyone else from the “old days” is still here, many of them with grayer hair or less hair. They’ve stayed in the area for all these years following the 1996 bankruptcy of the Sacramento Symphony. Meanwhile, I toured the US and Canada, met a wonderful partner who made it possible for us to live in an Airstream travel trailer on the road, had all sorts of new experiences, saw the country in all its variety as well as its sameness. In short, I was the one to leave and broaden my horizons while everyone else has stayed here. This work is supplemented by freelancing in what everyone calls the “Freeway Philharmonic”, all the orchestras in California’s Central Valley and in the SF Bay area. They also supplement their performance income with teaching music lessons, and some have non-music jobs. Many of my contemporaries in their forties and fifties have children who are now grown up and have left the nest. That’s when I really feel old, listening to them talking about their kids who have become adults — I remember these colleagues before they had children. Although I wouldn’t want to live in Sacramento — a lot of it is too frantic and suburban and crime-ridden and noisy and ugly-commercial — I DO appreciate the opportunity to play in these orchestras once in a while. It is gratifying to connect with colleagues with whom I played music for so many years. It’s like coming home to a family. I can’t tell you how many times people have said to me recently, “Welcome Home!” That feels really good. I am very fortunate that my family still lives in Sacramento, so I stay in the new addition that was built for my parents in their last years whenever I’ve got work down there. It’s always great to hang out with my brother and sister-in-law, and their very talented son (high school senior) who is already becoming a professional jazz bass player. I also enjoy my musician connections in San Jose, where I was a member of the local orchestra for several years before going on the road. This is another “family” of musicians with whom who I enjoy playing and socializing. I will be seeing them tomorrow night for the single rehearsal of the “Nutcracker”, followed by a performance on the 15th, and then four more from the 21st through the 23rd of December. San Jose is a four-hour drive from my home In The Woods. Luckily I have a place to stay in the SF Bay area, so I won’t have to drive all the way home after tomorrow night’s rehearsal. My dear violinist friend RA lives with her father in Lafayette, only an hour’s drive north from San Jose. So I will sleep there and then come back to The Woods on Wednesday. Next Saturday will be more of a challenge. The Nutcracker performance is in the early afternoon, so I will drive down from The Woods in the early morning, play the show and then drive the four hours back up the hill. I should be home by about 7 p.m. after that VERY long day. Then the following week, James and I will drive down together and stay in a hotel (hopefully in downtown San Jose, close to the Performing Arts Center) since I’ve got four Nutcracker performances in a three-day period. We need to find a place which accommodates cats, since we wouldn’t want to leave Rupert behind for that long in the cold house. We hope to visit a well-known dealer of recorders, who has his shop in nearby Sunnyvale; we’ve always wanted to check that out. We would also like to tour the famous Winchester House. Despite all the driving, I am thankful to have some gainful horn employment this month. I didn’t do a single gig in November. Patience, my dear boy! I’ve been gone from the orchestral scene for ten years and it will take some time to build up more work. Ideally, I would like to be able to do gigs about twice a month. This will give me time to enjoy my time In the Woods and pursue my other musical projects. Not only that, he insists that I remind my blog readers about his blog, right now! We had houseguests from Friday through Monday and greatly enjoyed their visit, but James and I are still tired, several days later. Being hosts and guests requires a lot of energy. Hosts try to anticipate every whim, every dietary need of their visitors, provide entertainment etc. while guests have to sleep in someone else’s bed, be away from their routines and in a completely new environment. Our visitors were from Tucson, where the daytime temperatures are still in the 70-80 degree range, sometimes higher. 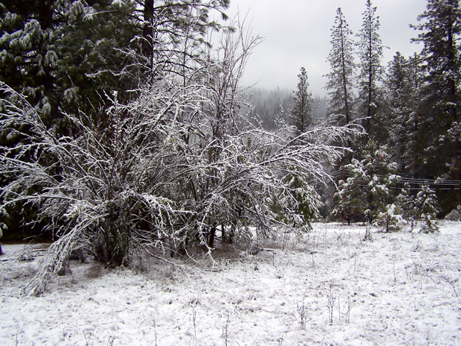 They arrived here In the Woods on Friday evening — we drove down to Sacramento to pick them up from the airport — and the thermometer in the barn read 28 degrees when we brought their suitcases in from the car. 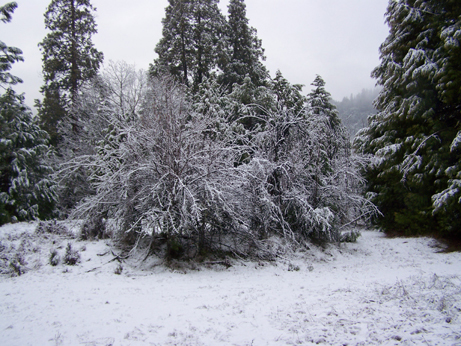 It was very fortunate that James had a feeling that it would get below freezing that night, and started the water faucet trickling before we had left for the airport. How ironic that we experienced our coldest temperatures to date this past weekend, while entertaining visitors from the Southwestern desert! 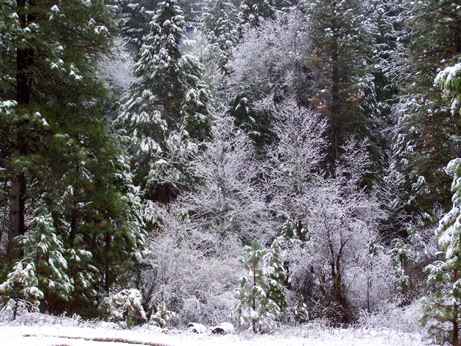 They brought warm clothes, thankfully; they had been advised of the general temperature range here in the Sierras. 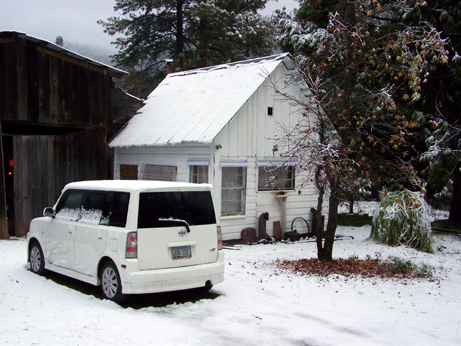 They slept in the Airstream trailer parked in the barn. The trailer has propane heat and keeps the space quite warm, but it is sometimes a challenge to adjust the thermostat to achieve that perfect medium between too-hot and too-cold. We took walks through the Woods, ate delicious food — James did a lot of cooking while I washed the dishes. We visited our dear friend L. and partner D. in Nevada City on Sunday; ate breakfast at a Cajun-California café and then toured the quaint downtown shops. On Monday before we took them back to the airport, we played through some music that I had composed for three recorders and horn. MA plays a number of instruments, including horn and recorder, while M. plays the horn. Since they flew here on a small plane, they left their horns at home. When they used to visit us in Bisbee, they always brought their horns, and we would play through my horn trios and also MA’s trios. (She’s quite a good composer.) So their visits always included horn ensemble activities, which was great fun. It was a definite challenge to write for recorders and horn, because the former instruments are soft while the latter can be very loud. For weeks before their visit I worked on some new pieces which included three recorders and horn. M. would play my horn while she was here, while the rest of us played on our extensive collection of recorders. First, MA, James and I played through a recorder trio that has three movements, before tackling the piece which included horn. There’s some good moments but I need to adjust a few things, including range and some orchestration issues. It’s always best to have LIVE people playing these compositions, rather than just relying on the music-notation program on the computer. For example, both MA and M. offered very helpful suggestions when we read through my horn trios in Arizona. As a result, those pieces are now more playable for the “general horn public” when I finally do publish them. The quartet for 3 recorders and horn was very interesting. The combination actually does work, as long as the horn stays in the middle and low range where the tone is softer and doesn’t overpower the recorders. There were flashes of excellent writing, but only for a measure or two here and there. I’ll have to build on and develop those more successful spots. I’d like to write two more movements for this Quartet, and try them out with MA and M. when we visit Arizona sometime in the next few months. It’s always stimulating to have house-guests. It was also good to have these good friends see us in our “new digs”. Now they can picture us sitting at our diningroom table in our Shaque In The Woods, with our matching Macbook computers, keeping the fire going!